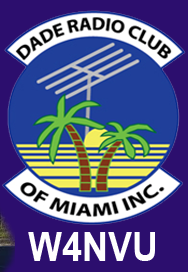 May – W4NVU – Dade Radio Club of Miami Inc.
Meeting was called to order at 19:34 with 31 present. We have a quorum. Lloyd presided over the meeting and welcomed everyone. Julio is still at work. The meeting was not broadcast live on the air tonight from the EOC. There was testing being conducted in another room tonight. Everyone took turns and stated their name and call sign. Lloyd welcomed everyone again. Lloyd reminded everyone present tonight to sign in. The minutes were posted on the website. A motion to accept the minutes as posted was made by Brendan, seconded by Miguel. Secretary: Joanne asked that everyone please sign in. Corresponding Secretary: Lloyd stated that there has nothing in the mailbox. Treasurer – Brianna was not present tonight. Ryan – The Website is currently up, there are some security features that Dade County will not allow it to come up. Will be working on a resolution. Club Elmer/PIO – Miguel as Club Elmer if you need any help, see him and if he can’t help you he will find some one that can. PIO – everything is ok. It’s not hurricane season yet and we already had our first named storm. No one needed our help. Newsletter – Julio is not here but Lloyd stated that he needs writers. If interested contact Julio. Merritt spoke about the Hambulance and the progress that has been made and what still needs to be done. We need a storage unit for the club to store club equipment. Anyone can help. He needs volunteers. Trailer Project – Jason provided the status of the trailer. He had some other projects but will start working on it soon. Steve showed us a new clip and how ham radio was a big help in Nepal. He had a group that worked with the International Radio Collation and the United Nations. The government wanted to charge ham radio operators but under the Tamper Act if you are part of the United Nations, you can’t charge. Armando read an article from the Red Cross. Steve then spoke about Field Day. It’s still on. June 27 and 28, the last weekend in June. Friday night set up is on hold right now, but we can set up on Saturday at 9 AM. Field Day starts at 1 PM. We will have plenty of food. We will not have a 1 by 1 call sign this year. It was too confusing last year. We will be W4SVI. Lloyd spoke about the 2016 Tropical Hamboree. He is still looking for locations. Lloyd advised that if you see something riding around, to please get him the name, location and a phone number and he will make all of the calls. Send the information to the club email. 2016 is our 50th Anniversary. ARRL will sanction it. Yeasu and HRO will both be there. The 147.000 – It’s disconnected right now. The 147.760 – Brandon advised it was working. The 444.200 – Carl advised its working. People are playing music. The Digipeater – 144.390 – Its up on a tower. D-star – Miguel advised that Julio has 3 frequencies for it and the application has been sent in to have it back on. It will be coordinated. Emergency Committee – Miguel advised that June is the next meeting at 6:30 PM. Net Manager – Brandon advised that the nets have been updated and changes have been made on the calendar. Some modifications were also made. Lloyd gave a presentation on Hurricane Season. We already had one named storm. Need to be ready. Hurricane Preparedness – Are you Ready? Get prepared now. Any preparation is better than nothing. He discussed other damages that occur in hurricanes. Know your school emergency plan for your children. Virgil added that you can store water in your own containers at home. He said to check our your generator and plug it in. See what it will handle. Make a checklist for your and your family. Have an escape route planned in advance. If your gas cuts off in a storm, have the gas company turn it back on or it can explode. Remember your pets and animals. If you need to go to a shelter, you must pre-register them. If you go to a shelter, take the supplies you will need. We have a disaster kit of what you should have on the website. At least 1 gallon of water per day per person. To find out what circuit breakers go to what household appliance, turn off the main breaker and then turn each one on at a time to see what it goes to. Then mark it down. A multipurpose Leatherman is also very useful. Awesome presentation! Steve gave a presentation on the ISS contact and handed out rare QSL cards to the members that made contact to Miguel, Virgil, Branden, Lenny, Ryan and he has one for Julio. He also gave them out to the each student at the school. Congratulations! Lloyd spoke about club shirts. They will be $35.00 each plus the shirt at Bayside. The shirts are good shirts and usually cost $50 – $60 each. He acquired a company in Hialeah. They will make them in Navy, Red, Black or White. They come with the embroidery and no pockets. The Club price is $35.00. A hat is $15.00. If interested, he will put together a list and will place an order. Julio will put it on the website. There will be a purchase order form and you can use pay pal. When the order is ready, you go and pick it up. Mike announced that tonight we have two new techs and 3 upgrades to Generals. Congratulations! Virgil asked if anyone has a 1960’s call book. Steve said he has some. Carl advised that there will be a statewide exercise on May 19. He will be running it from the EOC on 146.520 Simplex. We need people to man shelters so we can get them all in. If you can volunteer, please see Carl. Check-ins will be 9 AM – 4 PM; and 6 PM – 8 PM. Carl gave out a Disaster Assessment handout. This is the info to put into the computer. It has to be the exact same way. Call in and just advise if it’s a 1, 2, 3 or 4 when you check in. Email Carl at K4HLO@gmail.com. Pick a shelter. Lloyd asked if there was any other old business. There was none. Lloyd asked if there was any new business. There was none. Lloyd thanked everyone for coming. Brandon made a motion to adjourn, seconded by Miguel. The DRC meeting was adjourned at 20:28.